After Madonna, Pavarotti and Berlusconi, there is another "carcamano" asking for your atention! The Radicci! 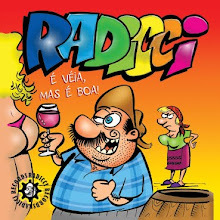 Successful on sales and with the public, Radicci won a legion of fans with his "carcamano" way of being and a family that includes his wife Genoveva (a feminist of the coutry), their teenager son Guilhermino and Nono the grampa. At the site www.radicci.com.br or www.radicci.it you can check Iotti's work and learn more about his characters. 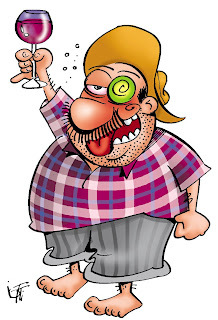 With Radicci, Iotti talks about all kinds of stuff like politics, family, religion, behavior, society and world. The old maxim to be universal from the village itself falls as a glove for the character and get interested readers from allover the places. 55 54 30282702 or by e-mail: iotti@radicci.com.br. The official representative of Radicci Entertainment, Iotti itself will be glad to arrange a visit and present his work.